efore World War II it was forbidden by law to export certain goods directly from the US to the British Empire, which Parker in the 1920's hoped would prove a lucrative market. So Parker decided to make Canada its first subsidiary. In 1923 Parker rented space on 350 Sorauren Avenue in Toronto, and began making pens by assembling US parts. Most of these pens shipped to Europe, bypassing the export laws. By 1932 Duofold pens were being manufactured in Toronto and anticipating a success of the upcoming Vacumatic Parker decided that the space on Sorauren Avenue was too small. Parker bought and moved the production to a plant on 154-158 University Avenue. In time the factory in Canada would be shipping to 70 countries all over the world. arker in Canada began manufacturing Vacumatics in 1933 and later also the Challenger, introduced in 1934, a low priced pen initially made from plastic similar to the early marbled Junior Vacumatics. The first Parker model solely made in Canada was the Televisor, a very attractive mid-priced button filler model that was introduced in 1935. It had many features in common with the Challenger and was launched as a sort of "gift" school pen, aimed at the mid price European markets, primarily the UK. Pencils were also offered. Photography © 2011 courtesy of Paul Martin. Parker Televisor MK I Black Standard, MKI Striated Green Standard, MKI Striated Grey Slender, MKI Striated Burgundy Slender, MKI Black Slender, MKII Burgundy Marble Slender, MKII Grey Marble Slender. 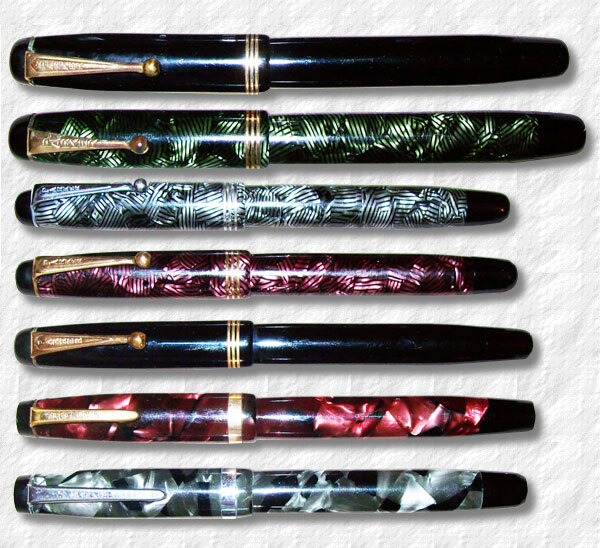 he Striated pearl pens had chrome trim, the other models sported gold trim. The pens had three cap bands and rounded black ends. The plastic used was very distinct and can also be found in Valentines, Duofolds, and Canadian made Websters, the latter made by Parker for the department store Sears. The Televisor was imprinted "Made in Canada. Parker Televisor. Reg TMS", but items also exist imprinted in French: "Fabrique en Etat Unis, Parker Televisor, REG TM". The Televisor featured a gold nib imprinted Parker Fountain Pen 14K Canada. As with other Canadian models they can often be found with flexible nibs. At this time a visible ink-view was a fad and the pen was fitted with a transparent window between the section threads and the body, hence the name Televisor. The name was well chosen, since the Television was an innovation that was rippling through the world. In 1934 the TV-pioneer and inventor of the video camera tube, Philo Farnsworth, had given the world's first public demonstration of a complete all-electronic television system in Philadelphia. And in 1935 France started their first regular transmissions from the Eiffel Tower, also Germany began their regular TV service this year. ince the Televisor was a button filler with a sac it didn't need a breather tube in the manner the Vacumatic did. But the Vacumatic was so popular that Parker in 1937 redesigned the Televisor "visiometer" which was now situated between the section and the threads. Parker even put a fake breathing tube (in fact a solid rod) inside the Visiometer to give the impression that the Televisor was also a Vacumatic-filler. The same faux design was fitted to the 1937 Challenger, the 1938 Parkette and Duo-tone and the 1939 Writefine. In 1938, following the 1937 Challenger design, the Televisor series was redesigned with a new tapered clip with the imprint "Parker" and a plain broad band. The previous rounded ends were now flatter with a mid point. The striated finished were discontinued. The Televisor MKII now also adopted the marble plastics of the Challengers. Both Standard and Slender sizes were offered. There were two kinds of visiometer windows on the Televisor. 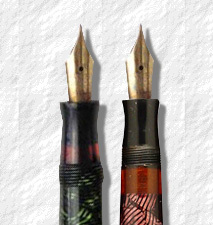 The newer version to the left, introduced in 1937.
he Televisor was phased out around 1940, and the Challenger followed in 1941, replaced by the striped Duofold Vacumatic range. lthough a low to mid-range pen the Televisor is much sought for by collectors, especially the attractive striated versions, although the marbled designs seems to be more uncommon. They have a reputation for being reliable and great writes, especially if one is looking for a flexible or semi-flexible nib. Televisior with a French imprint.